A bride and groom of ours owned a local fashion truck. The more we spoke about their business the more my mind reeled with ideas of how a mobile tux shop could be amazing for us. The fact that we can bring our shop to you as well as be in cities that we don't have a brick and mortar shop is invaluable. So I took the idea to the owners and about 8 months later the dream was realized. Mark Street bought a men's shop in Madison, TN in 1984. He slowly sold of all of the everyday wear (socks, undies, jeans) and bulked up in formal wear (tuxes and suits). Now 31 years later, we have 4 stores and 1 mobile location. My brother and I loved growing up in the business and decided to make it our career. Needless to say the Street family has a passion for the wedding industry. Free groom try on and style consultation- The bride got her "say yes to the dress" moment, and we feel like he should as well. This service allows the groom to try on several styles to see what he likes best. Believe it or not this is not common practice at other tuxedo shops. Bow tying service- This service is for those super classy grooms that prefer the look of the self-tie bow ties but don't know how to tie them. We come to the groom/groomsmen the day of the wedding and tie all of the bows. 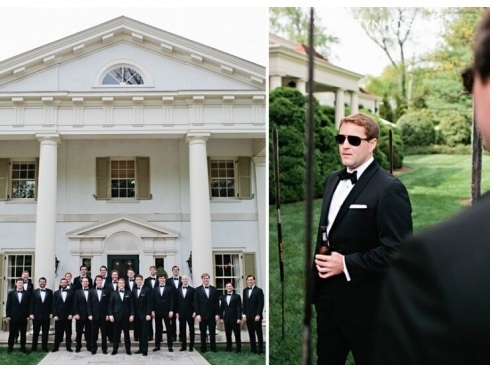 Concierge Service- This service includes delivery of the tuxedos, a trained Street Tuxedo employee to assist the guys in getting dressed properly, on site alterations, bow tying and pickup of tuxedos on Monday. Same Day Rentals- This service allows that last minute guy plenty of options. You can go into our warehouse, get measured and walk out with a complete tuxedo within an hour or less. Pick up of tuxedos on Monday- We will go to 1 central location (hotel, venue etc.) and pick up all the tuxedos. This is especially helpful for destination weddings where the whole wedding party is leaving town on Sunday. Tux Truck on site style consult- This service is for the couple on-the-go or maybe a destination wedding. We come to their home, hotel, venue, etc. prepared to do a groom try on as well as style consult. TT Bachelor Party Fitting- The Tux Truck will come to the bachelor party and we'll fit all of the groomsmen at one time. This is a great way to get it all knocked out at once while "the boys" are in town. Some wedding pros don't realize that we carry way more than just tuxedos. Yes, we rent suits too. Also, do you have clients going for that country chic look? You know, jeans, button up, vest, tie and boots? We can rent a la carte...vests, suspenders, shirts, ties, etc., whatever they need to complete their look. We also sell suits for those guys who want to keep their wedding ensemble.